In case you missed it, Windows Management Framework V5 Preview was released to the public today. One of the big things that this brings to the table is the OneGet module. What this module does is allow you to find and download packages from other shared repositories (in this case Chocolatey is the only one available at this time) and install those to your systems. First, let’s take a quick look at all of the available commands within this module. I’ll step through each of these cmdlets and provide examples (if applicable) of what they do. Note that there are currently no help documentation for this just yet. But there will be before the final release. This cmdlet will show all available sources that you can query for packages to download and install. In this case, only Chocolatey is available at this time. Note that this is not currently trusted. This is the cmdlet that will help you to find a package on any of the available package sources. Run it without any parameters and you will get back a lot of packages. Let’s go ahead and search for one package that we can then install. I know what I want from the source, now I want to install Sysinternals on my system. For that, I will use Install-Package to make this happen. There are quite a few parameters available here based on what you need to do. I am going go the simple route with my installation and not use any of the parameters and just pipe the results of Find-Package into Install-Package. Remember what I said earlier about this source not being trusted? Well, here is where that comes into play. You will be asked if you want to continue with the installation of the package. This goes along the lines of always make sure you know what you are installing and if you truly trust the source of the package. In this case, I will go ahead and continue on with the installation. Because I specified a Verbose stream, I can see all of the action happening behind the scenes from the download to the installation of the package. If successful, you will see the output object showing it as being installed. I want to install at least one more package, but this time I am going to change my trust on the chocolatey provider so I won’t get that prompt again. Only do this if you no kidding trust the provider! Note that there was no prompt this time for confirmation to download and install this package. You can also see how it downloaded and installed a dependent package as well. 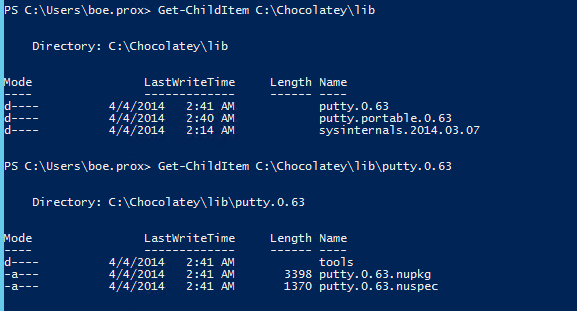 You can explore the location of the packages under the C:\Chocolatey\lib folder. Be patient with this as it may a minute to load everything up (this is going through the pipeline after all), so if you attempt to do anything before it finishes, it will cancel and nothing will show up to install. 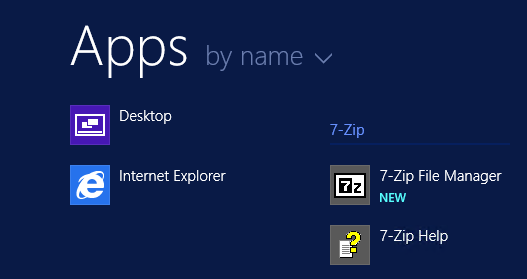 7Zip looks like a good install here to choose. By itself, this will show all installed packages on your local machine. Not many parameters available for this cmdlet. Not much to this one. If I want to find just a specific package, I can use one of the parameters to filter for it. Wildcards will not work here though, so if you want to find more than one package with a similar name, just don’t type a full name. This package does exactly what it says, it uninstalls a locally installed package on your local system. In this case, I will remove Putty from my system. Actually, I want to remove both instances in this case. And it is done! This was actually very fast. Just like my other example, this provides a great UI approach as well. This cmdlet is pretty self explanatory. For the sake of showing an example, I am going to remove my only source and the re-add it again (you saw this earlier when I use Add-PackageSource to change the IsTrusted property). Don’t be alarmed by the verbose output saying that it is creating a folder and saving a config file. This is just updating the package source config file to show that there are no package sources available now. 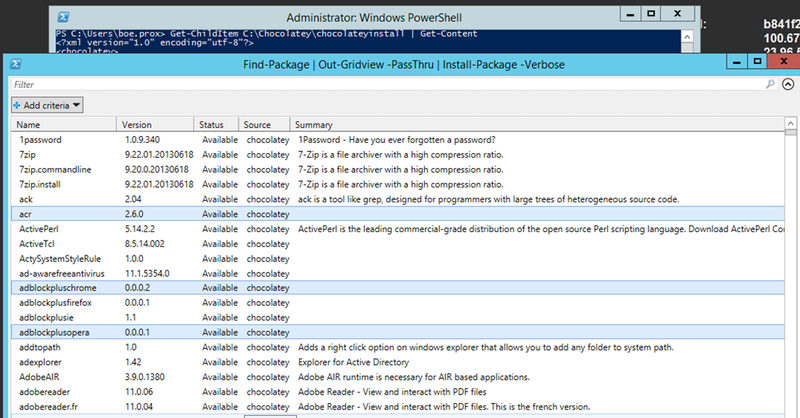 Digging into the config file, you will see that it no longer has any information in it related to the chocolatey package source. We can verify that we have no sources now using Get-PackageSource. Now let’s re-add this in so I don’t get in trouble. Here we…add a package source that we know about so we can access the remote packages. Trusted Determines if this site is to be completely trusted. I will be using every parameter here (excluding the common ones of course). I want this to be trusted so I will use the –Trusted switch. 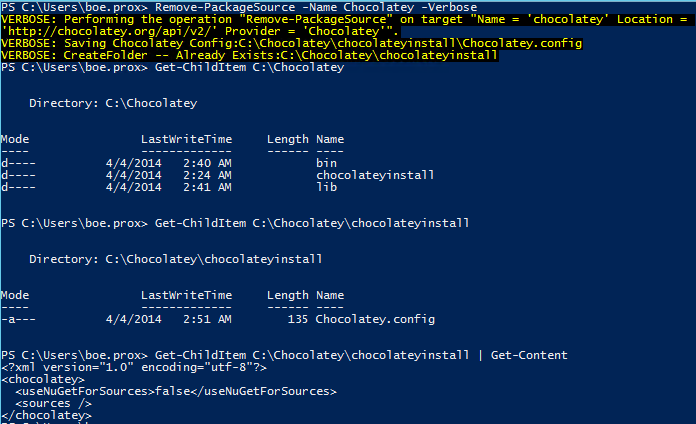 A quick check of the config file shows that our beloved chocolatey source is now back available to use to use. Now to verify with Get-PackageSource. Perfect! Our source has made its return! It will be more interesting to see how this will integrate with sources in an internal organization once we get more documentation. Also note that this does not verify that the source actually exists and is reachable. It only adds source to the config file. After a little research and work, I was able to stand up my own Nuget server to host an internal repository. You can find exactly what you need to do to install the server here. Seriously, do what it says and you will be just fine. Once that was done, I needed to some packages to test out. There is this link that will help to create packages, but I was feeling a little impatient and used a couple of packages that I had already available from my previous installs. In short, I now had a server and a couple of packages to use. First I created my package source. Verify the source shows up and then check for available packages. Lastly, I need to install a package. Now we have a local repository that works great with OneGet! And with that, we have gone through a simple walkthrough of all of the available cmdlets that OneGet has to offer at this time. Enjoy the latest release! 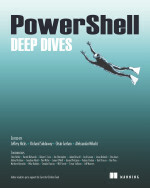 This entry was posted in powershell and tagged CTP, OneGet, Powershell, v5. Bookmark the permalink. I’m quite excited to see what comes of this.